This metal alloy Bottle Opener offers a sleek, brushed metal finish. Great for opening bottles, as well as opening can tabs! Place on your fridge for easy access when you get thirsty! Many insert choices providing unique and personal touches. Also, available with blue, purple, teal, and black metal inserts. Bottle openers are metal alloy construction with brushed finish. Recessed on both sides. Bottle Opener size is 4.25" x 1.625". Magnets come unassembled. Inserts are uncut alder wood sheets. 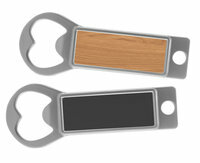 Lot includes 24 Metal Bottle Openers with magnet backs and 1 alder wood sheet, which makes a total of 25 wood inserts. Materials make 24 metal bottle opener magnets with wood insert.